The city of Sombor (German: Sombor, Hungarian: Zombor) was first mentioned in 1360. In the 15th century, the city was fortified with walls and piling by the Cobor family. In 1541, the Ottomans conquered the settlement. 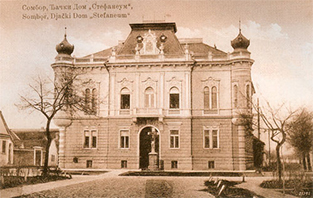 The Ottoman writer and traveller Evliya Çelebi described Sombor as a big settlement surrounded by a wall. The so called “Pasha Tower” (Pašina kula) possibly stems from the time of Ottoman rule. Today, the building holds part of the town archives. The Ottomans left Sombor in 1687. 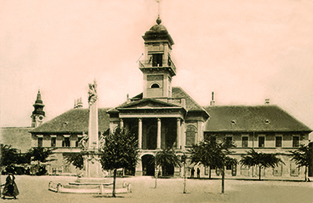 In 1702, Sombor became a military town. In 1749, it was given the status of royal free town and became the administrative centre of colonisation of Bačka. The central architectonic symbol of the town is its old town hall. It was built in neoclassical style in 1842 on the foundation walls of Count Jovan Branković’s old castell. Its walls held the city administration and the civil service. In its noble ballroom, the town magistrate would meet, the ground floor held shops. The County building is located in a beautiful park, surrounded by yew trees, hackberry and sycamore trees. The eclectic building was designed by Gyula Pártos from Apatin. The extraordinary construction holds the oil painting “Battle of Zenta 1697” which was created by German painter Franz Eisenhut. He lived in Bačka Palanka and painted the work on the occasion of the thousandth anniversary of Hungarian settlement in 1896. Several rich German families’ palaces can be found in the region. 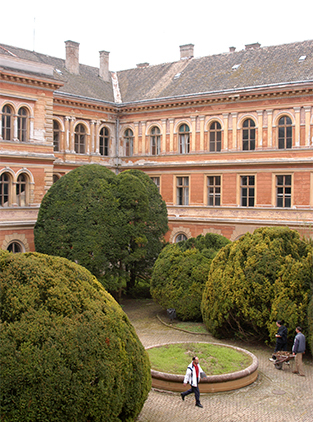 One of the most representative buildings is the house of the Fernbach family in Apatin. Today, it holds the city’s museum. On the road to Apatin, the prominent villa of the Hermannsdorf family built in the style of a medieval palace is located. The main streets of Sombor are dominated by representative business and residential buildings. Amongst them, the “Semze Palace” is the most remarkable. It was built be the Eigler family who had come to Sombor from Prigrevica. Inside, beautiful murals as well as one of the most remarkable mosaic windows can be found. The execution sites, on which Germans were killed after World War II, are memorials of a more recent history. One of these places is Kronić Palace, built in 1906 in eclectic style and one of the most beautiful buildings of Sombor, in which over 800 people were killed in December 1944. Several villages that were established by Germans belong to the administrative district of Sombor: Kolut, Stanišić, Riđica, Gakovo, Kruševlje, Kljajićevo and Rastina. The villages have representative baroque churches, for example the remarkable ruin of the church of Kolut which displays a Turkish mosque in its apse dome. The town hall at the turn of the century. Park of the county building.